Children run through the snow as it fell at Morris Middle school Friday, Dec 8, 2017, in McAllen. 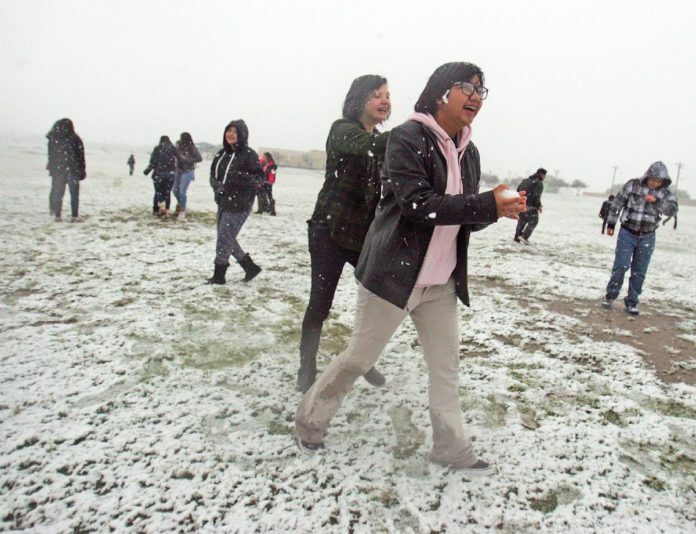 McALLEN — In terms of snowfalls, what visited the Rio Grande Valley on Friday was merely a dusting. But the late morning flurry, coming during the morning rush hour, energized Valley residents enough to prompt one of them on social media to declare it the Blizzard of 2017. And, as should be expected with the rare appearance of snow that was at the front edge of a massive winter storm that pushed across the southern United States, residents of the RGV took full advantage of its first snow day since December of 2004. Children — many who had never seen the white stuff before in their lives — could be seen frolicking in fields while adults reverted to childhood as they stood for selfies in the midst of the flurries. Officially, the accumulation of snow was so slight that weather officials couldn’t measure it, although they reported that in the northern parts of Hidalgo County they expected up to an inch of snow before it tapered off during the lunch hour, said Tim Speece, meteorologist for the National Weather Service.